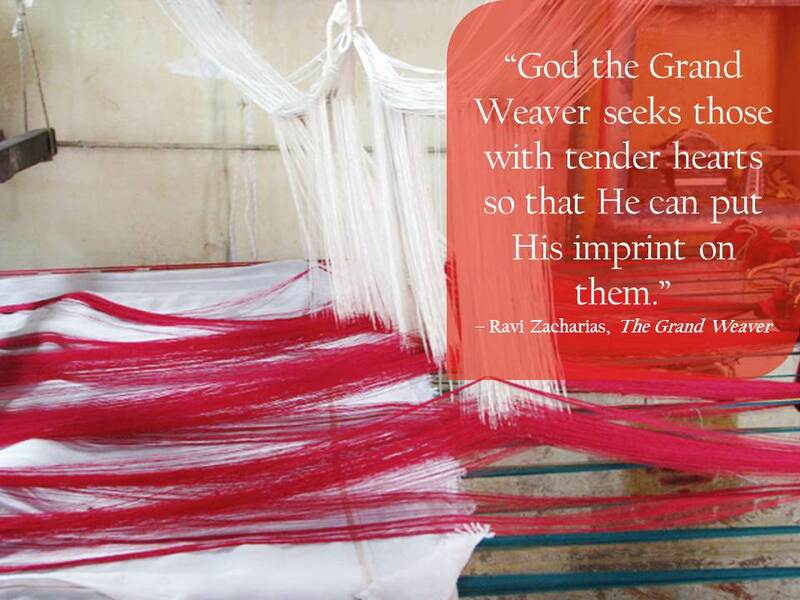 Ravi Zacharias in his life-changing book, The Grand Weaver, suggests that God intervenes in the lives of every one of us and speaks to us in different ways and at different times. Not only is God the Creator and Author of life, but also as Ravi likes to say, God is the Grand Weaver that pulls each thread into a work of art that displays his magnificent and unfathomable workmanship. Ravi shares a poignant story when he visited the northern city of Varanasi, India. The city is most famous for its spectacular and breathtaking saris that every bride in India wants to wear in her wedding day. Visiting a local factory, Ravi illustrates the process of weaving a beautiful sari and how God has proven himself as a Grand Weaver. “Some years ago, I was visiting a place known for making the best wedding saris in the world—saris rich in gold and silver threads, resplendent with an array of colors. I expected to see some elaborate system of machines that would boggle the mind. Not so! 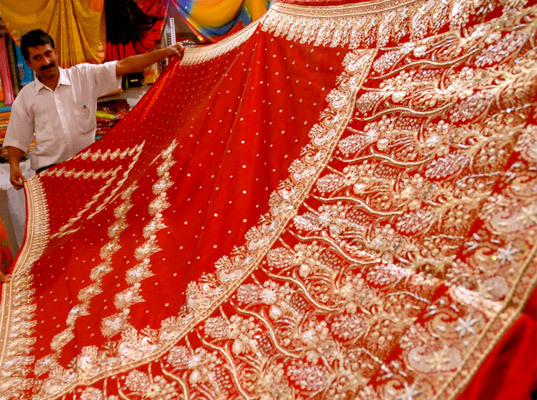 Each sari was made individually by a father and son team. The father sat above the son on a platform, surrounded by several spools of thread that he would gather into his fingers. The son did just one thing. At a nod from his father, he would move the shuttle from one side to the other and back again. This would be repeated for hundreds of hours, till a magnificent pattern began to emerge. The son had the easy task—just to move at the father’s nod. All along, the father had the design in his mind and brought the right threads together. The more I reflect on my own life and study the lives of others, I am fascinated to see the design God has for each one of us, individually, if we would only respond. Little reminders show the threads He has woven into our lives. Allow me to share from my own experience. As one searching for meaning and in the throes of a turbulent adolescence, I found myself on a hospital bed from an attempted suicide. It was there that I was read the fourteenth chapter of John’s Gospel. My attention was captured by the part where Jesus says to his disciples, “Because I live, you shall live also.” I turned my life over to Christ that day, committing my pains, struggles and pursuits into His hands. The pattern that God has been weaving is unlikely to be noticed at first. It may seem to you just a bunch of disparate threads. But when you stop and focus on God’s weaving of your life – you can’t help but notice a beautiful tapestry that unfolds as you respond to His call. Every thread matters and has a specific purpose. 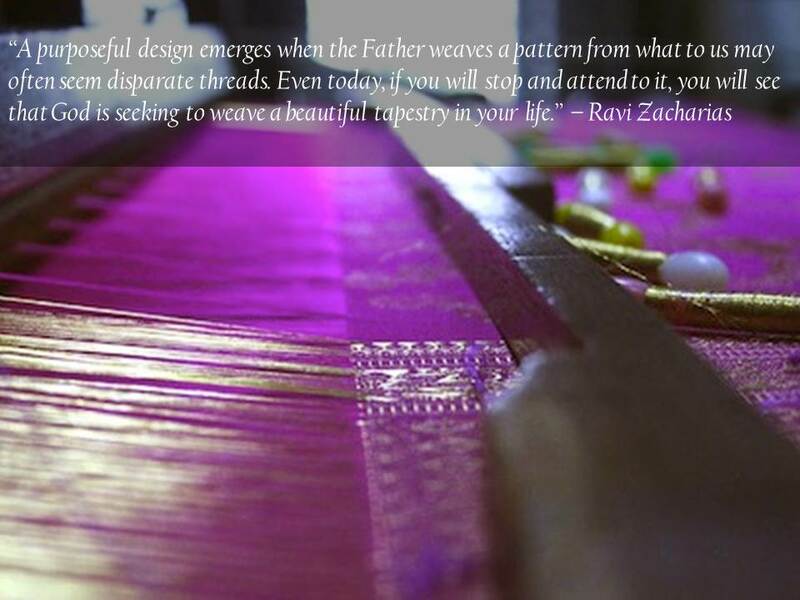 Ravi Zacharias further unpacks the different threads (e.g., your DNA, calling, disappointments, will, worship etc) that we all face and how God weaves those into a beautiful tapestry. Question: Have you felt the Grand Weaver using the different threads in your life to weave a beautiful tapestry? If so, in which way?